Tiny “match-head” wires act as built-in light concentrators, enhancing solar cell efficiency. Crystal growth on a nano/microscale level results in the formation of “match-head”-like, three-dimensional structures that enhance light absorption and photovoltaic efficiency. Match-head semiconductor nanowires focus incident light for greater overall efficiency. The match heads are naturally formed during the wire-growth process, which can be applied to various materials and structures for photonic and optoelectronic devices. 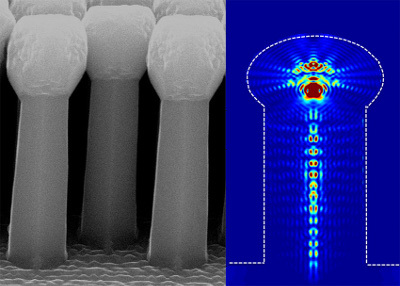 This is the first large structure grown on a nanowire tip and it creates a completely new architecture for harnessing energy. Enhanced light absorption and efficient, photogenerated carrier collection are essential characteristics of highly efficient solar cells. Nanowires with embedded radial junctions are promising building blocks for highly efficient photovoltaics because of their ability to achieve these two characteristics. The new technology in this highlight provides a novel method for enhancing optical absorption and photovoltaic efficiency with crystal growth. Controlled silicon crystal growth on the tops of silicon wires creates a match-head structure. The match head acts as a light concentrator. Light absorptance was increased by 36% and photovoltaic efficiency was increased by 20%. Because the match-head crystal is naturally grown and minimizes surface energy, this technique is applicable for a wide range of materials and device architectures to boost performance. The ability to control the shape of the nanostructure is essential for manufacturing next-generation semiconductor devices, such as photodetectors and light emitters. This work was performed in part at CINT, a U. S. Department of Energy, Office of Basic Energy Sciences User Facility at Los Alamos National Laboratory (Contract DE-AC52-06NA25396) and Sandia National Laboratories (Contract DE-AC04-94AL85000), and funded in part by the Laboratory Directed Research and Development Program at LANL, the DOE Office of Energy Efficiency and Renewable Energy, Solar Energy Program (EB2101010), and a director’s postdoctoral fellowship for Binh-Minh Nguyen at Los Alamos National Laboratory. Shadi A. Dayeh acknowledges support from the U. S. National Science Foundation (CBET-1236155 and ECCS-1351980).